The topic for this year’s day-long gathering was Food Hubs. Jeremy was asked to facilitate discussions about Emerging Technologies in Food Hubs. The topics unfortunately did not unearth “food hub technology” that we all thought might be there, but it was certainly an interesting discussion covering everything from phone Apps to food sovereignty to getting farmers in northern Maine a better Internet connection making it possible to do business from the farm. One thing we learned is that most in food hubs and pretty much all food projects are still seeking technologies to help them succeed. Internet Farmer hopes to help in the process of matching logistics and technology to support our local/regional food systems. Speaking of logistics, here’s a Tedx talk from Michael Rozyne CEO of Red Tomato. His philosophy is right on by inserting value in to our food chain, and that it is all about logistics to create our new path. This video was especially great to reflect on given that their Executive Director was the keynote speaker for the day. The company is clearly getting it right as far as we can see. Welcome to the nation’s first cooperative institutional dining service. Which, is the first time ever to challenge the 3 global providers of such services. If they win the USM contract, they will be expanding the local economy in a way never seen before. Internet Farmer has worked with these people for years and it was a pleasure to engage in a campaign to change Maine’s economy. At first, we had to develop a lot of content quickly for the launch of the service at the release of the USM Request for Proposal. In about 6 weeks Jonah put together a marketing team and we developed website content and ideas for how to run a campaign online. We also wrote a video script and shot the video to tell the story of MFSC. It was a busy 6 weeks. Once the content was developed for the website we dove in to NationBuilder.com. This is a site building tool, but also a CRM software, e-commerce mechanism and campaign management. Internet Farmer was impressed at how it all worked. It was easy to get payments going, setup a template for a nice looking website, totally connected to social media, and you could see the world was at your fingertips as we added information to the system. This is Obama-level campaign software, a game changer in fundraising and community building. And it’s available to anyone for as low as $30/mo. A great tool if you want to build a world around you and have it be organized and manageable. It was such a good experience Internet Farmer is becoming a NationBuilder.com developer to further our work in food justice. After launching we’ve seen the CRM work really well. It automatically tags people based on being a member, a non-paying supporter, volunteer, etc. As the campaign moves down the line, we’ll also use the automatic tagging to track referrals so we can see who is raising the most funds and growing the membership in order to develop those relationships. Sending emails has been easy. To whatever list, or sublist, you wish. So easy. Setting up the payment system was one of the easiest experiences I’ve had. We used PayPal and connected it to NationBuilder and it was all set. It has plenty of options to work with anyone’s commerce setup. Internet Farmer is thankful for being a part of this project. A first director credit reminded us of how awesome producing media is to tell a story. Learning NationBuilder.com was a gift. And being a part of a big team working for something great couldn’t feel better. Speaking of the first director credit and story telling, here’s the video we put together… thanks so much to Joseph Brunnett (videography) and Patrick Bonsant (editor) for their incredible work on the video. And cheers to everyone on the marketing team who all contributed ideas and logistical planning to make this come to life. This was truly a team effort and I am so thankful for the opportunity. 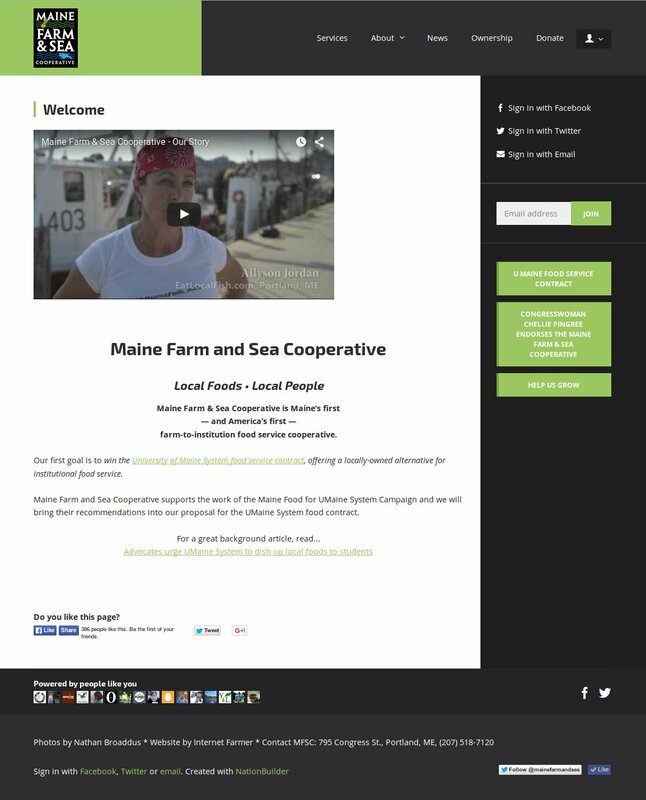 This summer we got to work with CLF to improve a website for a service they coordinate focused on food hubs in New England. 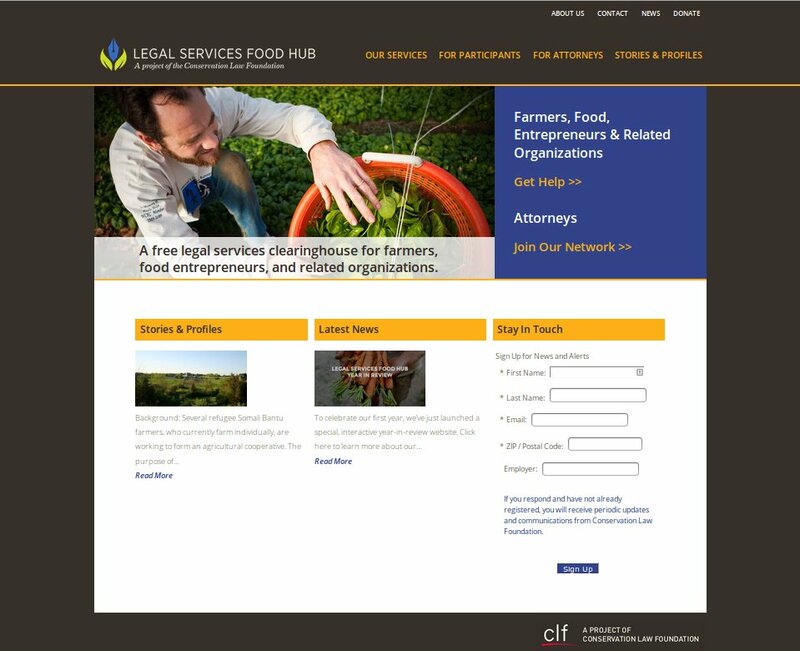 The site is a connector for food hubs looking for legal advice and guidance through a cultivated network of lawyers interested in working pro-bono to help get them started. As with many websites there was a lot of information, and the first version of the site had a tough time offering people easy access to all the site had to offer. The basic site/business info, how to get help, how to become part of the lawyer network… it’s a lot to organize so anyone can “consume” what you have to offer. Mapping out websites like this also give us a physical representation of the site, offering groups a simple way to communicate about complicated communications. For me to work with them, and for them to work within their organization. Through mapping out the website, and analyzing how the site would be used going forward, we then worked with CFL to develop a design and WordPress function that would take the now-well-organized website and display it all to the user in a simple way, as well as make it an easy site to update for CLF. There was also back-end website processes that weren’t quite how they wanted it to work. Through customizing forms and improving how emails were put together within WordPresss, CLF was able to connect people faster and smoother than before. They could use email filtering/forwarding to move things along more automatically. Thanks to CLF for working with us. Their work is so important and Internet Farmer was thrilled to do work and food justice all in one project. We have until December 15 to comment on the re-proposed FSMA Produce Rule and Preventive Controls Rule from FDA. FSMA was written in to law in 2011 and it is now up to the FDA to define the rules that farms must follow. Traditionally they ask for public comment and write the rules and BOOM… done, that’s it, rule is written. In this case, they did the first round, and this is the re-proposed rules we are now commenting on. I’m told a 2nd round is quite rare, so this feels fantastic to get this rare chance to comment knowing that the FDA is actually listening and seems motivated to write good law. Read the FSMA One-pager, and learn more about how things effect you, and what you may wish to comment on. This page has a bit more detail and extremely helpful in helping you define what is going on. Go to CLF’s Website and you can fill out your comments that they will submit for you. Share this with YOUR networks… anyone in the US! ** IMPORTANT… each comment must be unique so be sure to make some kind of change or your comment will not be counted. ** ALSO IMPORTANT… there’s a lot here to dive in to, and to touch on every issue is a little too much for most of us(including me!). if you have no idea what to do, go to CLF’s website with the link in #2, make a slight change to the template you’ll find there and submit. that’s it! Why do you care about FSMA and taking this action? Because if you are reading this message, you are a part of what I’ve learned to call the Terra Madre (Mother Earth) network. YOU have a voice in our nation’s major policies to help shape FDA rules that may hurt small farms. YOU care about our US Food System. This is a moment where your voice really matters and it’s worth taking 30 minutes of your time, and promoting to your personal networks. I believe this definition binds ALL OF US who work for the betterment of food in our communities. And it is these common values that say we want to, and can, speak with one voice when the time is right. It is the power of all the networks we belong to, whether or not they have been to the Terra Madre event. It’s also for those on my email lists of clients and people I work with through Internet Farmer and BuyingClubSoftware.com, it’s those in my community who I do work and idea exchange with, it’s those I’ve met all around the state of Maine. It’s also the networks of everyone on my lists that I’ll never even know about! It is by asking this network to speak in one clear voice that we can be heard. This is why from this moment on I will call on this network when the time comes where we can speak as one and shape our future. Internet Farmer won’t be bug you every day about the millions of actions going on in our food movement, but we will be back the next time we see an opportunity for us to weigh in on important issues that effect the entire US food system. Until then, thank you for your work, keep doing it! And when it’s time to act, let’s act! If you are seeing this for the first time and are not on my email lists, please sign up by clicking Subscribe on the right hand side of the page. It seems that on September 21, 2014, SNAP/EBT will no longer be free. I’m not sure it was ever entirely free, but there wasn’t a monthly fee. One company seems to be offering the equipment at $75/mo with no other fees and no long lease agreements on the equipment. On one hand, my gut says this is terrible. Our system creates this need, so why shouldn’t our system facilitate the whole circle? On the other hand, for $75/month you are able to bring customers in the store who really need your healthy products and otherwise couldn’t afford it. Furthermore, you make money by collecting on a purchase backed by government funds. Plus, it’s a business expense that could be seen as a type of marketing. Whether you are a physical store, an on-line store, a buying club, a CSA… this may cut in to your cash flow. That said, if offering SNAP/EBT fits in your mission, it won’t be too bad. My fear is that those who were considering starting a free program would not pay anything if they don’t feel they can afford to spend another dime. I’ll keep the hope that the mission and potential income is motivation enough to do it. We really need to shorten the name of this initiative. Since the forum in October, this article was published, and I thought it did a good job of summarizing what we’ve done in the last year, and some of the things we are working on. Helping more people grow their own food, watching the schools create an amazing local foods program, creating an urban farm to supply a Portland institution and edible landscapes filled with apples, chestnuts, peaches and berries. It’s the sheep mowing that kills me and makes me so psyched to be a part of this. This was a joke at first, that has ended up with legs to save money on mowing, which apparently is a big bill for the city that we pay for. So we were actually asked to put a proposal together for a pilot sheep mowing project. How lucky am I to help make that happen? Geezum. About a year ago Jeremy helped organize a community food forum in Portland, ME with a group of folks who had the network and the funding to gather everyone we knew to talk about our food and how it comes to our plates. From that event Portland’s new Mayor, Mr. Michael Brennan formed the Mayor’s Initiative for a Healthy Sustainable Food System. (a.k.a. Portland Food Council). The group is a mix of city staff, businesses, citizens, farmers and gardeners, and policy makers. This is a Mayor’s appointed committee, but anyone is welcome to join the monthly 2nd Friday meetings, held at City Hall room 209 10am-11:30am. People are also encouraged to take part in the various sub-committees, or working groups, covering Policy, Schools, Urban Agriculture, Business and Enterprise and Food Security. This Wednesday October 23rd the Initiative is holding a follow up forum to let people know what we’ve been up to this past year. We’ve done some great work and hope to spread the word and get more interested folks involved. We found this new buying club that wanted to launch a COSTCO-like offering, but with better food from good sources, and as direct as possible. We support this kind of thing, and recommend it. It is both our business, and political action, to help make this happen. We wish them the best of luck in succeeding.